This is amazing, a new feature has been added to the opera web browser. 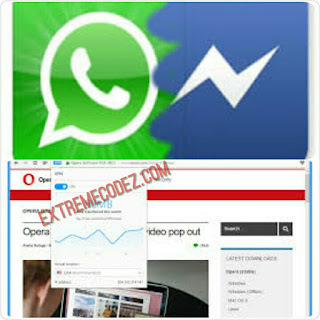 The two messaging platforms WhatsApp and Messenger has been added to Opera mini browser. Few days ago Whatsapp added how to pin up to 3 chats at the top and Messenger released it's lite version of the app. This great feature is coming after the announcement of Opera mini Neon earlier this year — an alternative browser that wants "to change the way you use the internet". This newly implemented features now lets you pin messengers in the desktop browser. Facebook Messenger, WhatsApp, and Telegram have their tab in the sidebar and can be used side by side with the main tabs. want and pin them, so your chats do not interfere with other things you are doing on the web. You also have shortcuts available for switching from one service to the other, we hereby say this amazing yes! it is most especially when you have a monitoring eyes always watching over you. One interesting feature about this update is that you can easily share images to these services by dragging and dropping the photos on the messenger’s icon. This means you can now access the two messengers whenever you want and pin them, so your chats do not interfere with other things you are doing on the web.